John Geer, a 46-year-old dad of two, told police officers, “I don’t want to die today” before one cop shot him once in the chest. Geer, according to other officers on the scene as well as Geer’s own father, who witnessed the police killing of his son, had his hands up when Fairfax County, Virginia, Officer Adam Torres fired at him from about 15 feet away — as Geer stood in the doorway of his own home, newly released documents show. For the latest update on the John Geer shooting story, see the bottom of this page. After the bullet struck him in the chest, Geer took a step back into his townhouse, closed the front door and collapsed to the floor. There, he bled to death as police waited nearly an hour before calling in medical assistance. Instead, police called in a SWAT team, which smashed in the door of Geer’s home with a military-style armored truck. When SWAT officers stormed into the home, Geer was dead. Torres can be heard telling an investigator the following in the audio recording, above. Geer was not accused of any crime and had no reported criminal record. He was said to be upset that Maura Harrington, his domestic partner of 24 years, who is also the mother of his two children, had informed him that she was ending their relationship. But he was speaking calmly to police before he was shot. Harrington had placed the original call to police, reporting that Geer was throwing her belongings onto the street. The police shooting of John Geer, whose teenage daughter was also at his home when he was killed, took place on August 29, 2013. But Fairfax police had remained close-lipped about the shooting, releasing no information whatsoever about why Geer was shot, or who shot him, until last Friday, January 30, when — after being ordered to do so by a judge — the department dumped 11,000 pages of documents and 54 audio recordings of witness interviews into the public record. The documents and interviews confirm what Geer’s father, Don Geer — as well as a close friend and neighbor, Jeff Stewart — have maintained since Geer was killed by Torres nearly a year-and-a-half ago — that Geer had his hands raised when he was killed, and was unarmed. Geer possessed a gun in a holster, but it was not on his person at the time of the shooting. The below photo, taken by Harrington, shows the officers outside Geer’s home. Torres can be seen with his weapon leveled in Geer’s direction, at center. The complete set of documents and recordings can be accessed via the Fairfax County police website, accessible at this link. 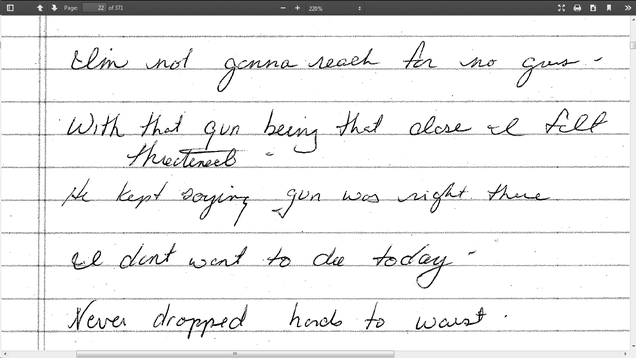 The recordings above on this page, compiled by the Washington Post, reveal Torres claiming that Geer was reaching his hands to his waistband when Torres shot him. But the another officer who had been negotiating with Geer for about 50 minutes directly contradict Torres’s claim — as did four other eyewitnesses. Fairfax police had previously maintained that they could not comment on or release documents pertaining to the shooting of John Geer due to their ongoing investigation. But, in fact, the U.S. Justice Department is conducting the investigation, and the feds never raised an objection to release of the documents in response to a lawsuit by Geer’s family, leading a judge last month to give Fairfax police 30 days to make the information public. UPDATE: The family of John Geer filed a wrongful death lawsuit against Fairfax county over his shooting. On April 21, the county announced that it had agreed to pay the family $2.95 million in a financial settlement to end the lawsuit. Maura Harrington said she agreed to the cash settlement partly to avoid putting her children through the trauma of testifying in a civil trial, but also to insure their financial future in the absence of their father. But Harrington also expressed outrage that 20 months after the shooting of John Geer, the police officer who killed him, Adam Torres, had not faced charges. In June, Torres was still on the Fairfax County police force and no charges against him were pending. However, on June 10, county prosecutors announced that — almost two years after the killing of John Geer — they had convened a special grand jury to investigate his shooting, and would begin calling witnesses.